There's a lot of speculation right now about who will fill Ted Kennedy's Senate seat until the special election in January '10. Most of the money rides on the WEED-oh. Someone from another country answered me just that way when I asked about marital status. It has never left me. Is it not so much more musical than WID-oh? Natasha Fatale. Uh-oh. Does anybody else smell BATTLE OF THE WINE-BOTTLE SHAPED WOMEN WITH PURPLE DRESSES AND BARE ARMS? This bold section carries some risk of a big Mo backlash but would be worth it because of her obvious connections to the Russians. Back in the 80s, American hero Ted Kennedy was pretty busy conspiring with our Cold War enemy, the Soviet Union, against the interests of the United States government. What a guy, huh? In the end, the Ruskies didn't go for it, but dollink with an insider like Natasha, Ted Kennedy's life work of treason could be carried on. Aunt Zeituni. Talk about your Boston insider! Here we have a little old lady, emigrating (more or less) from a poverty-stricken country, doesn't know anybody or how anything works when she lands here and in a very short time has managed to redirect good deal of American tax dollars for her benefit, complete with subsidized housing, a hip replacement and lottery tickets. This is one smart cookie - if she managed all that on her own flying under the radar of the law, imagine what she could accomplish with the state of Massachusetts behind her. Look at that picture taken as she emerged from the courtroom after her successful deportation challenge - she instinctively turned herself into a Kennedy-esque red head without even knowing there'd be some kind of Irish-related opportunity in her future. You can't learn that - you have to be born with that kind of intuition. Of course, her obvious familial connections don't hurt, either. Chelsea Clinton. Oh, wise and all knowing Interent - please let this one be true! It's too delicious. 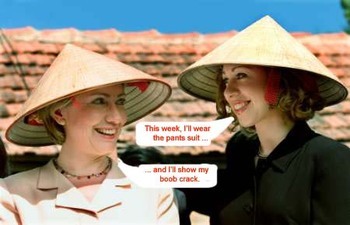 Have you heard about all the hubub going on right now for what is rumored to be Chelsea Clinton's imminent wedding? Guess where? CHAPPAQUIDDICK. Burn! Would this not be the icing on the big fat Kennedy fail cake if the whole of the MSM was forced to report a triumph of the Clintons at a location that they could not help but tie to Teddy's cowardly actions and subsequent cover-up in 1969? Maybe not the best choice among the herd here, but she's be a fairly good pick. She's got the Let's Ruin American Healthcare gene from her mom, her dad's philandering gene while dormant in her must be able to signal somehow to the people of Massachusetts who seem to admire that so much, and when the time comes to vote on the healthcare bill, she could probably activate the YES button with that expression alone. It's a whole new Hill we're seeing now - the fun one. This must be the Hilary that Ole Bill was drawn to. In this video clip from Puerto Rico, it's not the drinking that makes news - in fact, it's odd to see a photo of Hillary now without a drink in her hand. No, it's the dancing. Here she is in Puerto Rico dancing and drinking. The thing that is so endearing in this clip is how she makes the Blissy Face at 0:25.Charming! You've gotta give her credit - she is by far the most interesting candidate we've seen in decades. Here she is making a last grab for the heavily Catholic Puerto Rican vote by going around in her own Popemobile. Is that the PR Secret Service or is that the Memphis Mafia? Either way, that gal knows how to have a parade. Never give up! Hillary dusts off the Madonna bracelet for more Catholic pandering and just in case she really is going to concede tonight, she gets 28 year old First Child C.C. to coach her as she practices her braying for a bid to become the first woman ever to be a living mascot for the Donks. Like mother, like daughter - here they both choose to position themselves to block powerful men from the camera lens. Hillary towers over Carl Rove and John Wayne sniffs C.C's armpit. Well, this is the day I hoped would never come - the day that America is expecting old Hill to roll over and concede. And she just might do it, too. Of all the photos we've looked at and all the messages we've deduced from her wardrobe choices, this one is loud and clear. Now that she's got nothing left to lose, she's letting us see her cankles. A: Put A Little Boogie In It. When last seen, our gal Hill was plodding across Pennsylvania wearing the Brown Suit of Gloom. 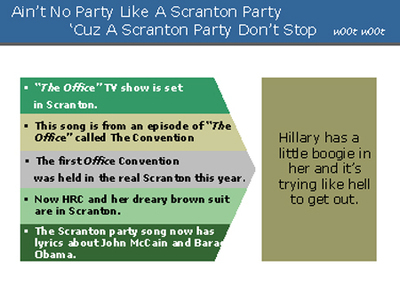 Here she is in Scranton doing her best imitation of a used Kleenex. Now this hurts me. CBS news refers to that song as tailor-made. Don't they realize it's one of the classic references from The Office TV show? Perhaps not everyone can recite the dialog word for word like I can so in the end, I suppose it's harmless enough but it still hurts. That's what she said! In other show biz news, funnyman Sindbad has redeemed himself forever as far as I am concerned by refuting Hillary's tall tales of "a hair-raising corkscrew helicopter landing in war-torn Bosnia" and then a mad zig-zag dash across the tarmac to evade snipers. Sinbad, Sheryl Crowe and intrepid Jill-of-all-trades, Chelsea Clinton were along for the ride. In this Wapo interview, Sinbad reveals that the "scariest" part of the trip was looking at Chelsea's ugly mug wondering where he'd eat next. 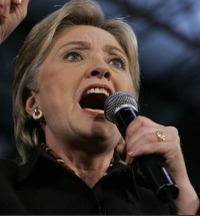 You know I want HRC to stay on the national stage as long as possible, but if you are planning to vote for her, please share with me why you would do so. I cannot imagine why anyone would. My life is fairly unexciting, and I accept that. I'm used to it and I take my pleasure in the adventurers of others. This week, there were two major carrots dangled in front of me that caused my heart to beat faster. But it was not to be. Traffic tie-ups prevented his attendance at the rally. And look what the woman was wearing - leopard spotted accessories! 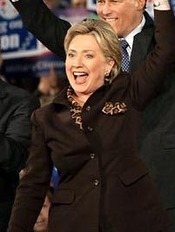 Our gal Hil is getting a lot of mileage out of that brown suit - here it is at the recent Los Angeles debate paired up with an unfortunate choice of accessories. I like a nice bit of turquoise as much as the next girl, but Hillary - did your stylist miss the plane that night? 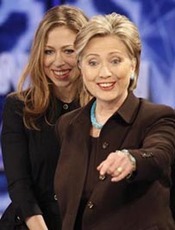 FYI - Hillary is definitely NOT pulling little Chelsea around like a show pony. Take that, David Schuster! I'm sure there's a very good reason why she has to stand on stage glued to her mother's backside, mute and grinning. And darlings - if the vision of the leopard accessories is not enough, how do you like her in kitten heels? Hillary has deployed her cankle-cloaking hemline but cannot resist taunting us with a peek at the Hillary within. Kitten heels, people, Hillary in kitten heels! And the vision is only slightly marred by the swollen feet peeping out over the vamp. Obviously, she left her water pills in the case with her coordinating jewelry. Immediately following this disappointment came news that another compadre, on another coast and on the other side of the aisle, would be attending an event celebrating the highlight of the Republican social season - the Lincoln Day Dinner. The entertainment promised here was none other than New Jersey state treasure Uncle Floyd. So balance is restored in my universe. 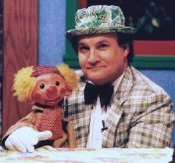 I might not be getting a first-person account of a Hillary sighting, but by golly, I'd have me some Uncle Floyd. I was completely confident that I'd get as personalized a report as humanly possible, since this reporter had previously turned in satisfying reports about hotel toiletries and Vera Bradley handbags. He arrived wearing a Yankee cap and clubhouse jacket. He travels light: his porkpie hat, plaid jacket and a guitar. Oogie was nowhere to be seen. Uncle Floyd established his signature style and stuck with it, unchanged over the years: the plaid jacket and porkpie hat. Not everyone can pull that off. Fans of mp3s, crude song parodies and Jersey jokes, rejoice! Because he didn't get to hear it in person, I present to you now one of Uncle Floyd's classic compositions: Deep In The Heart of Jersey. Why this is not the official state song, I cannot imagine. The HRC campaign has taken exception to a remark made by an MSNBC anchor suggesting the Clinton campaign has "pimped out" Chelsea. Maybe Obama is right about the generation gap thing and Hillary and her people are out of it (and so is David Schuster) - somebody get these people over to Urban Dictionary to look up the definition of pimped out. 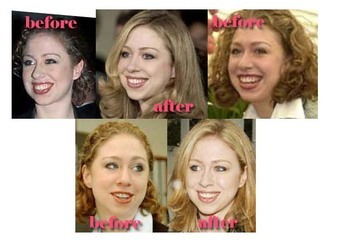 Chelsea already got pimped out with her multi-procedure cosmetic surgery - too bad she's reverting. One thing surgery couldn't fix is her man hands - she's still got her mother's face and her daddy's bony fingers. Now if by "pimped out", everyone involved interpreted that to mean "physically used for the benefit of a master" - again, look it up - then I don't think that there's much question that the campaign is doing exactly that. And it's not going over very well, either. Observe this clip of The View ladies making fun of the phone calls Chelsea placed to them on behalf of her mother. Now if you want to talk about the real definition of pimping out, Hillary herself is the master. Did I not tell you that something was fishy with her sudden embrace of the bling? Observe her wedding ring finger one day before the DVF endorsement and look again during her Seattle appearance on Thursday. See what I'm sayin'? NOW who's the pimped out one? With this post we inaugurate a new feature here at Cripes, Suzette! : The Wart Watch. when I fist saw this thing on her upper lip, I tought it was an unfortunately timed herpes outbreak, but I've seen it in more than one shot now. It's not always prominent - depends on the lightings, the angle and the thickness of the makeup, but if you look for it, there it is. Click on the image on the right and you'll see that Wart Watch comes in at about a Level 3 on a scale of 1-10, with 10 being the maximum wartiness. ... and so on. After all the details of her hard working nature, her career moves, her concern about 9/11 (!) and speculation about her own political ambition, we are informed that she is a is "a Christmas-cookie-baking, churchgoing Methodist" and might possibly be waiting to turn her "cuddly and affectionate relationship" into a White House wedding. Two noteworthy statements shine the light on the family dynamic: "Those familiar with the Clintons envision her as a strategic resource "and the remarkable "Ms. Clinton was present when her father and his advisers debated how to acknowledge his affair with Ms. Lewinsky to the nation". And then, this wonderful sentence: "Most of the women her age wore bright gowns and bare skin, but Ms. Clinton wore a dark pantsuit, her hair smoothed and fastened into a strawberry-blond sheet." In one masterful stoke, we are delivered the image of the serious C.C. as a mini-HRC. How does one fasten hair into a sheet? If true, this could be a boon to the slow blog blues of a summer Sunday. In preparation, I've already bookmarked several sites that document Chealsea's 2004 plastic surgery.